Genuine FUSO drive belts and tensioners are designed and manufactured to exacting tolerances, delivering smooth and quiet performance. Fuso NZ holds more than 10,000 unique parts lines in stock. 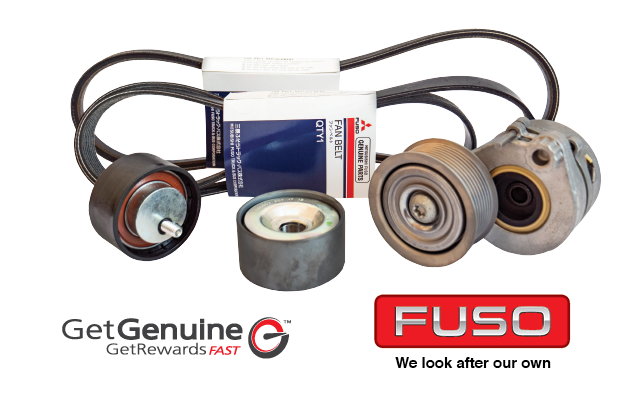 Genuine FUSO parts offer a better return on your investment, delivering quality and durability to maximise the time your truck spends on the road. Original equipment backed by 24-month warranty* when parts are installed by an authorised FUSO dealer. Contact your nearest dealer today to enquire and make a booking with one of our certified FUSO technicians - highly trained professionals who know your truck or bus better than anyone. *24-month unlimited km warranty applicable when parts are installed by an authorised FUSO dealer. Parts installed by anyone other than an authorised FUSO dealer carry a 12-month unlimited km warranty.